In honor of Smokey Bear's 75th birthday – August 9, 2019 – the U.S.D.A. Forest Service, the National Association of State Foresters and the Ad Council have teamed up to celebrate the nation's favorite bear. To ensure that Smokey Bear's important message of wildfire prevention is heard throughout the nation, Stephen Colbert, Al Roker and Jeff Foxworthy have joined the historic campaign, lending their voices to help expand on Smokey's iconic "Only you can prevent wildfires" catchphrase through the use of facial recognition and voice technologies. For years, through the voice of Academy-Award nominated actor Sam Elliott, Smokey Bear has only said five words: "Only you can prevent wildfires." Now, to complement this signature message, Smokey's friends are stepping up to say more about wildfire prevention on his behalf and help millions of Americans understand the importance of the issue. Utilizing cutting-edge facial recognition and mapping technology, coupled with instantly recognizable celebrity voices, the animated emoji campaign has enabled Smokey's famous friends to speak through him and further raise awareness of fire safety and wildfire prevention, in an effort to reduce the incidence of unplanned human-caused wildfires. 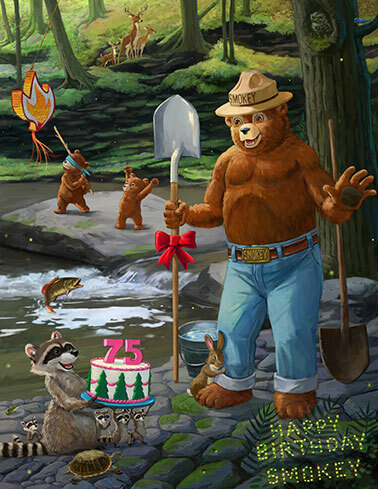 "I can't think of a better birthday gift for Smokey than to have his wildfire prevention message echoed through the use of advanced social media tools like animated emojis," said Forest Service Chief Vicki Christiansen. "In fact, since wildfire season is year-round, Smokey's message is even more important." For 75 years, Smokey Bear has been recognized as a symbol of wildfire prevention. In fact, Smokey Bear is the longest-running PSA program in U.S. history, created in conjunction with advertising agency FCB, who has developed Smokey Bear campaign assets pro bono since his first introduction in 1944. While his campaign began three-quarters of a century ago, and great strides have been made in preventing human-caused wildfires, Smokey Bear's message continues to be as important as ever, as wildfires continue to be one of the most critical environmental issues affecting the U.S. On average, almost nine out of 10 wildfires nationwide are caused by people. "Smokey Bear and his friends know that wildfire is not just a western issue or a summer phenomenon. It's always wildfire season somewhere in the United States," said Jay Farrell, Executive Director of the National Association of State Foresters. "This is why it is so important that Smokey's message resonate year-round and nationwide with all Americans. This year's Smokey Bear wildfire prevention campaign promises to do just that." "Ensuring an icon like Smokey remains fresh and relevant for today's audiences is no simple task," said Lisa Sherman, President and CEO of the Ad Council. 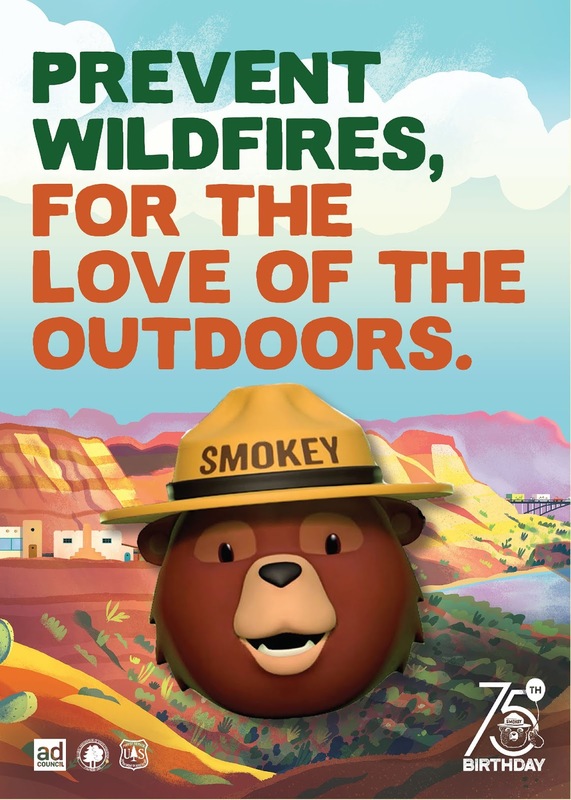 "With this new work, our volunteer agency FCB created a campaign that not only honors Smokey's past but celebrates his enduring legacy and message of wildfire prevention." "75 years ago, FCB, in partnership with what would become the Ad Council, gave birth to Smokey Bear. All these years, he's been reminding us that 'Only You Can Prevent Wildfires.' In other words, there's a little Smokey Bear in all of us," said Susan Credle, FCB Global Chief Creative Officer. "This year, we are asking people to listen to their inner Smokey Bear. People sharing stories about why they love the outdoors and how they protect our country's beautiful wildlife — what a perfect gift to give Smokey Bear on his 75th birthday!" Smokey Bear first appeared on a forest fire prevention campaign poster in 1944. Two years later, he and his message were featured on a series of stamps, making his way into households nationwide. Starting in the 1950s, Smokey Bear made his debut first in radio commercials and then on television, paired with a number of well-known actors and celebrities including B.B. King, Barbara Stanwyck, Betty White, Dolly Parton, Leonard Nimoy, Ray Charles, Ted Nugent and more. In the decades since first being introduced, the beloved icon has continued to be featured in TV, radio, print and on posters, stamps, billboards, memorabilia and other forms of media. First voiced by Washington radio personality Jackson Weaver, Smokey Bear's message has been brought to life for the past 12-plus years by Sam Elliott, and is now amplified through the voices of Stephen Colbert, Al Roker and Jeff Foxworthy. The new creative is being distributed to media outlets nationwide and will run in donated time and space, per the Ad Council's model. To learn more about Smokey Bear and wildfire prevention, visit SmokeyBear.com and follow Smokey on Facebook, Instagram, and Twitter with the hashtags #SmokeyBear75 and #OnlyYou.